Only a small part of a writer’s career, no matter what genre they focus on, is the act of writing – most of the writer’s schedule is filled with record keeping, office work and marketing. The first year after a book is published is often referred to as the “honeymoon period” because this is when the authors direct contacts have been exhausted. Typically, sales drop off and the author becomes disenchanted with the thought of facing more promotion activities for a seemingly “dead” book. Sadly there are only a few in the industry that seem to understand that a marketing plan should last the life of the contract for that book, sometimes longer. 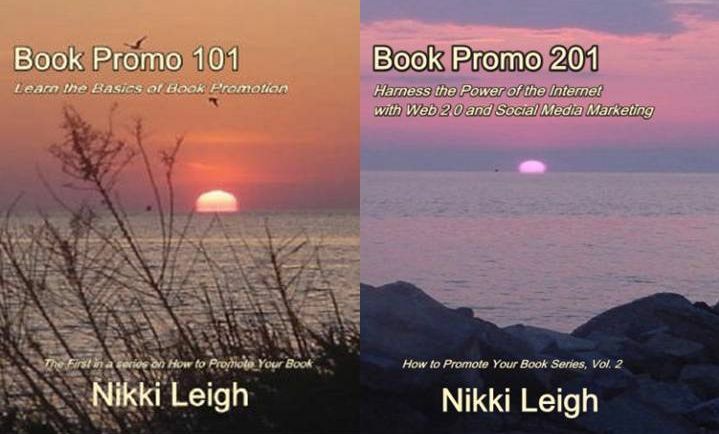 Nikki Leigh has graciously put together a series entitled Book Promo 101 and the first book of this series has just been released. This first installment is an overview of the basic process and tools that are involved in book promotion activities. The author will go into each of these tools in more detail in the upcoming books in this series. This is a great way to have a brief understanding of what each of these tools are, why they are employed and some great tips on how to avoid using them ineffectively. In total there are 16 chapters along with Appendices that offer extensive lists for review sites and best selling book sites. Book Promo 101 was released in March 2008 by Write Words Inc – an imprint of Cambridge books. The author, Nikki Leigh, has been involved in marketing businesses, books and web design for over 15 years. She has 4 novels and 4 non-fiction business books that are available for readers to investigate through their favorite bookseller. She also runs several bogs, offers virtual book tour services to her clients and facilitates classes in character development. I’ve had a membership on http://www.ecademy.com for several years, but I discovered something new this morning that I have to share. The site is sort of difficult to navigate – especially when you’re new — but they are also great about adding new options for their members and free members can have a very nice presence. I just learned about their new Company Profile pages – which include great information. This is my company page – that took me less than 5 minutes to create. Company Profiles are a new service for all Ecademy members which consolidate all your social media everywhere on the Internet, and presents your company expertise, products and services to prospects, customers, suppliers, employees, associates, partners and to the millions of visitors to Ecademy each year. Why Publish and Advertise a Company Profile? I searched long and hard for a very specific Twitter tool. There are an unlimited number of Twitter gadgets – but I wanted one that I could go to ANY web page – click one button – and create a tweet about it. I wanted this “magic” button to pull the page title, shorten the link and provide a short description. There were many tools and gadgets that did similar things, but none did that for absolutely any page. I discovered Twit It. Sounds innocent enough – but its wonderful. I will say up front that I’ve had to “re-install” it several times, but that takes about 2 minutes. Twitter has become the place to check out what our friends, competitors and other are doing and what they are interested in. It’s very easy to add content to your Twitter micro blog by using a bookmarklet. I admit it took me ages to find this tool, but it was worth the effort. There are links to all kinds of tools, but I wanted one that would let me submit a link in a click. There is an article about bookmarklets at http://myopiclunacy.com/2007/11/06/microblogging-with-urltea-my-twitter-bookmarklet. Scroll about half way down the page and you will see “Twit It”. Place your cursor on this hyperlink, then drag and drop onto your navigational bar. Next time you want to mark a page, open the page, click on “Twit It” and “submit” and you’re done.